The teenager was on a pace to break her own personal record at a middle school cross-country meet. Half-way through the two mile run, her coach shouted the good news, but then, with a half-mile to go Makenna Finnegan from Shelby, Ohio saw an opponent grimacing in pain and holding her side. Without a second thought to winning the race, Makenna slowed down, grabbed her hand, and they finished out the race together. “Her nature is very caring so I was not surprised at all,” Steve Clark, coach of the Shelby Middle School team told Good News Network. The teen athlete (pictured top, right) had once asked Clark about this very situation–about what she should do if she saw someone fall, because any physical interaction results in disqualification. “I’ll take this ‘spiritual victory’ over something tangible like a personal record any day,” he added, with pride. The girl she aided in the September 19 race was Elaine Hohman, whose mother happens to coach the team from Findlay. 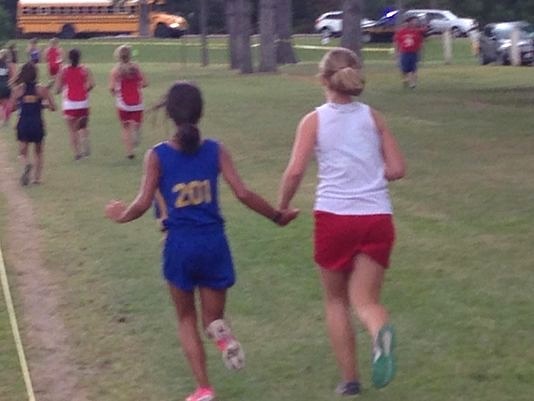 They were equally proud and moved by the sportsmanship from the teen competitor who forfeited the race, but gained the respect of everyone at the meet that day.